Author(s): Siyuan Chen, Debra F. Laefer, University College Dublin - School of Civil, Structural & Environmental Engineering Dublin, Ireland Civil Engineering, Dublin, Ireland. Eleni Mangina. Background: Unmanned Aerial Vehicle (UAV) technology has exploded in recent years. Presently UAVs are beginning to be major in roads into geographical mapping, site inspection, agriculture, and search and rescue. Methods: This paper reviewed patents and papers worldwide related to both hardware and software for the construction and deployment of UAVs and is intended to provide a snapshot of currently available UAV technologies, as well as to identify recent trends and future opportunities in affiliated hardware and software. Results: Basic components related to self-designed units are explained (e.g. platform selection, autopilot control comparison and sensor selection), and current applications and research areas are discussed. 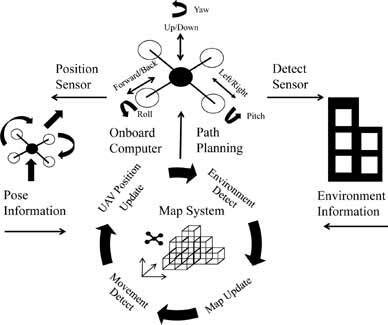 Since autonomous navigation is a key technology in UAV applications, concepts about this are also explained. Conclusions: Both in the self-designed and commercial markets, UAV components are becoming modularized. By following a standard components list, it is no longer difficult to make a customised UAV. In this way, commercial products are becoming cheaper and more standardized in their performance. Current limitations of UAVs has also become more readily detectible. Extending the flight time, improving autonomous navigation abilities, and enriching the payload capacity will be the future research focus to address these limitations. Keywords: Unmanned aerial vehicles, drone, multi-rotor, navigation, remote piloted airborne systems, payload capacity. Affiliation:University College Dublin - School of Civil, Structural & Environmental Engineering Dublin, Ireland Civil Engineering, Dublin, Ireland. Keywords:Unmanned aerial vehicles, drone, multi-rotor, navigation, remote piloted airborne systems, payload capacity. Abstract:Background: Unmanned Aerial Vehicle (UAV) technology has exploded in recent years. Presently UAVs are beginning to be major in roads into geographical mapping, site inspection, agriculture, and search and rescue.